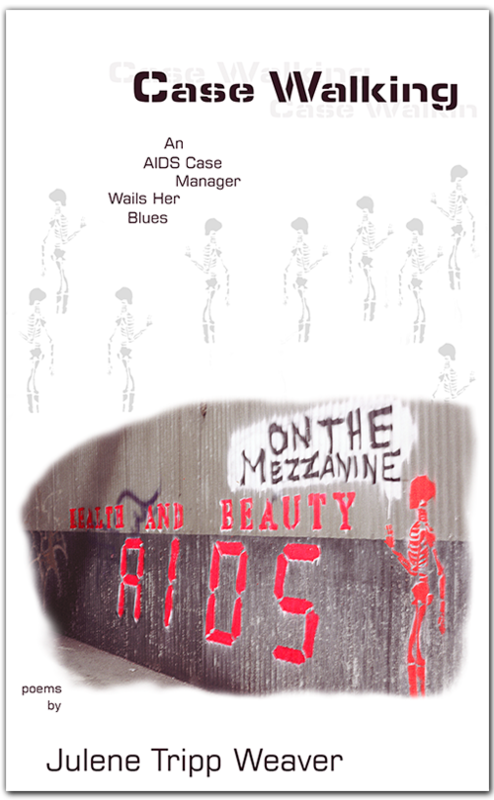 This moving book of poems brings readers into the sad, dark heart of the AIDS epidemic. Tripp Weaver changes voice from poem to poem, bringing us true tales of people suffering from AIDS, their families and social workers. Her frustration at the limitations of what she, a social worker, can do for her charges screams through the printed words. The book itself is small and pretty, with a sparkly page inside the cover, and tied with a satin ribbon around the spine. Your wonderful book arrived a few weeks ago. I’ve read it again and again, in bed, on floor, on toilet, on bus. Awed both by the writing and by the huge mountain of lived experience that the book rises up form like a mountain peak. So many haunting word images. The bottle of salad dressing, address book filled with crossed-out names. No idea quite why the line that most knocks me over are “Before his decline, rain was never quite so hard.” Chekhov wrote—“Any idiot can face a crisis; it is this day-to-day living that wears you out.” What you have charted in what happens when the two become one, when day-to-day is unrelenting crisis. I don’t know how you’ve done it, the writing and the living. I couldn’t. So what I want to say, mostly, is—congratulations!!! I hope you are pleased in every cell with your book, and live holding it in your hands. Small as it is, it weighs so much of life and pain and hope—art too! I can feel the wealth of poems that wrap around it, that didn’t make their way in. Writing about HIV infection and AIDS is almost a sub-genre of American poetry filled with voices as disparate as Essex Hemphill, Tory Dent, Gerry Gomez Pearlberg, and Dean Costos, to name only a handful of the chorus. 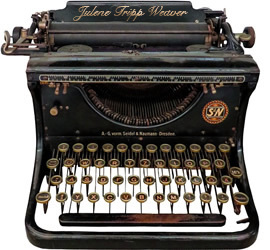 Julene Tripp Weaver’s chapbook, Case Walking, enters into this conversation, but enters not from the perspective of a person with AIDS or a caregiver, but as a service provider. Julene works as a case manager for people living with AIDS in Seattle, WA. This vantage point provides a new and important perspective from which to explore through poetry the impacts of the disease. When one dies high on drugs where will the soul go? will one withdraw in the spirit world? Does the soul wander aimless? no frost, but bitter bone rain drenched forties cold. someone is throwing it away, cushions already disappeared. or maybe some drugs left behind, any drugs. all found positive in her urine analysis. the couch is a luxury item to explore. A new territory where she might find treasure. It will never sit in the living room she does not have. talks about some car accident early in her life. get it together this time. her mother doesn’t believe a word she says anymore. she will not take that kind of talk. who is just doing her job, asking this high addict to leave. It’s her job, it is all she can do to restrain herself. to go who knows where in this city, the next several days. she gets kicked out after she trashes the room. The downtown shelter is where. for some excellent fundraiser to end drug resistant TB. and she eats them all. who called the Housing Authority, got her rescheduled. live a semblance of a normal life. So maybe, when she dies, her soul will walk a different path. “The theme of “Unfinished Work” is meant to symbolize all that remains to be done in helping those affected with HIV/AIDS and to prevent the spread of HIV. While we have seen many medical breakthroughs and people are living longer, healthier lives, many are still facing on-going illness and infection reates are continuing to rise. With no cure or vacination on the horizon, we are likely to be battling this epidemic for years to come. What lies ahead is our “unfinished work.” Each submission should reflect the artist’s hope, desparation, celebration, fear, or dream about HIV/AIDS and the work left to be done.” It was a juried show with catagories of Visual arts, Multi-Media/Film, Creative Writing, and Music. The poetry judge was Eloise Klein Healy. Poet Eloise Klein Healy the founding chair of Antioch LA’s pioneering MFA in Creative Writing program.